The dark forces of the Devil comes to a small town with malice in mind in this sadly sub par adaptation of the Stephen King book. It has a lot of promise and at least the actors keep you watching, but falters deeply because of how uneven it is , a long time and how it can’t decide on what kind of movie it wants to be. The quiet and sleepy town of Castle Rock is changed when one day a mysterious man arrives. The man in question is Leland Gaunt; a sardonic and seemingly benevolent older man who sets about opening a shop. This shop, given the name Needful Things, is a cornucopia of objects that hold deeper promise with the residents than they realise. As people flock to the shop, the objects seem to be just unusually perfect for each and every person as if expertly picked out for their personal longings. But Gaunt is not interested in making a profit of his stock as he charges ridiculously low prices for his produce. Instead, the crafty man has his customers play tricks on others as a way to pay him back. At first, the playful pranks are somewhat amusing but as time goes on they morph into much darker deeds. This arouses the suspicions of the decent Sheriff Alan Pangborn, who seems to be the only person able to resist the allure of the shop that promises wonders to every resident of Castle Rock. Bewildered by the events surrounding him, he digs into the past of Gaunt and discovers that he may not be human at all. As the town is torn apart by violence, murder and unrest, it is up to Alan to bring down Gaunt, who is enjoying manipulating the ordinary people of the town into shocking acts of horror and carnage, all for the desired trinkets he entices them with. 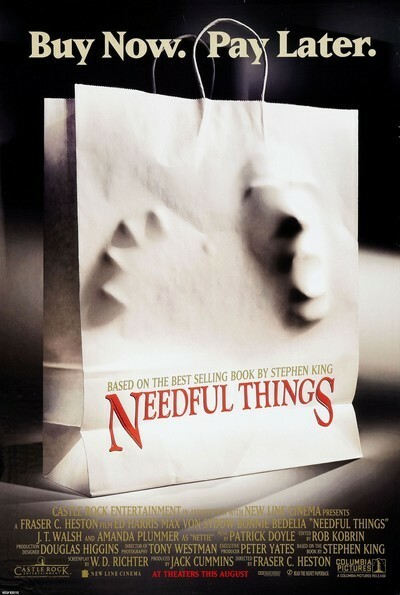 Needful Things is one of those movies that has some good ideas but can’t quite put them across successfully on the screen. The main fault lies with the direction from Fraser C. Heston. He can’t quite make his mind up on whether he wants Needful Things to be a grisly supernatural horror or a fantasy stuffed with black comedy. There are only a few moments that really work in the film, but the rest is not thrilling, scary or darkly amusing in the slightest. The story itself could have been extremely intriguing with the subject of what people are willing to do when tempted by their heart’s desire, but a weakly written script stops any chance of that. Which brings me on to the next flaw which is the pace and running time. Now I don’t mind long movies as long as they keep me entertained, sadly Needful Things drags like a snail and becomes something of a chore to view. Everything about this movie just seems to take way too long to get going and when it does, it is too late to make up for the flaws in pacing. The score which does bring something of a fiendish quality to the dark events provides at least some sense of tone, yet it feels overly bombastic and doesn’t gel with the story. The one thing that shines in Needful Things and stops you from switching the movie off is the cast assembled. As the devil in disguise whose benevolent demeanor and welcoming air entices curious customers to their doom, Max Von Sydow is obviously having a good time. And it must be said he contributes a charming but very sinister presence to the film that brings at least some effectiveness to proceedings. 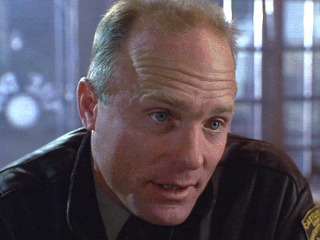 Ed Harris is very good( then again, when isn’t Ed Harris good?) as the honest but firm Sheriff who is the first to see the wicked game being played by Gaunt. It is then up to him to prevent further destruction as he goes up against the devil incarnate. Bonnie Bedelia does just fine in an underwritten role as the love interest, bringing just the right amount of sweetness to the part to cover up how undeveloped the character is. Then there is J. T. Walsh, quite effective as the slime ball boat salesman who gets his comeuppance by becoming the loyal servant of Gaunt. 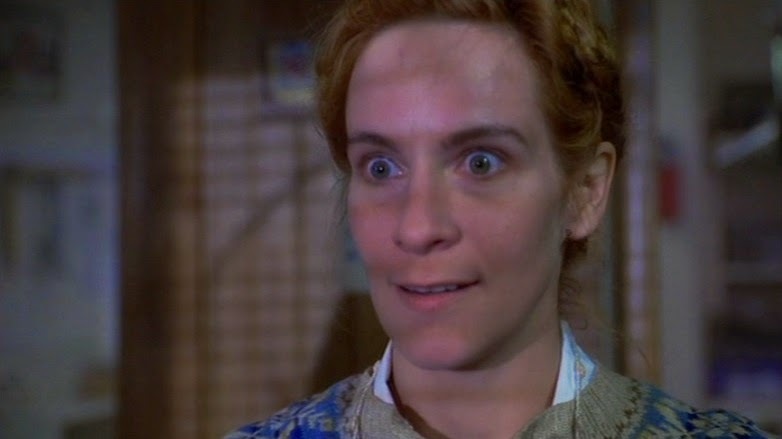 Standing out in the cast is Amanda Plummer, all nervous tics and wide eyes as the kooky but vulnerable baker Nettie, whose good nature is turned to murderous rage. She isn’t in the film for long, but she makes an impact on it and lends some creepiness to this film that is devoid of it. As the 11-year-old kid who is the first to encounter the evil of Gaunt, Shane Meier does a credible job at showing how his innocence is ultimately manipulated into something darker. 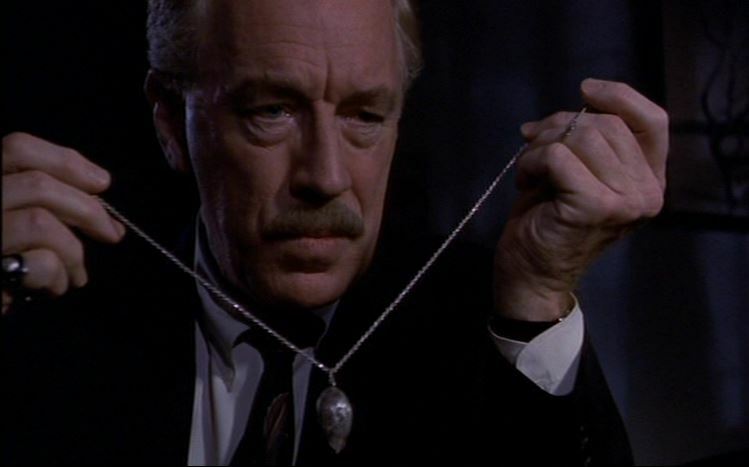 Neither particularly scary or engaging, it’s only a commendable cast that keeps Needful Things afloat. And even with the talented cast, it isn’t enough to make a great movie and sadly it becomes one of the not so good King adaptations. The Hunger Games: Catching Fire is the second film of The Hunger Games series. Following on from the groundwork set by the predecessor, it emerges as a smart, darker and more thought-provoking film. Featuring an excellent cast, a relatable heroine in the form of Katniss Everdeen as played by Jennifer Lawrence and some amazing visuals, Catching Fire is an sci-fi/action movie with brains that still delivers the goods. After surviving the 74th Hunger Games by threatening to kill themselves, Katniss and Peeta return to District 12. They are paraded around as victors, but Katniss is having trouble adjusting to life again. Although seen as a beacon of hope by many, she is plagued by horrific nightmares of what she had to do in order to survive. The corrupt President Snow senses rebellion is brewing as a result of Katniss’ defiance. He blackmails Katniss into saying that the reason she survived was her ‘love’ for Peeta, when in actual fact she did it to enable their safety. He threatens to kill those most dear to Katniss if she doesn’t comply with his actions, including her good friend Gale, who has feelings for her. Although he wants Katniss dead, he employs the help of the enigmatic Plutarch, a man working on the Games. Plutarch suggests using a special version of The Hunger Games in order to relinquish rebellion. In this version of the games past victors can be chosen and sure enough Katniss and Peeta are both selected for the brutal games. As the games begin, Katniss must ally herself with some of the other skilled competitors in order to emerge alive from the carnage that will follow. Taking over the reins from Gary Ross, Francis Lawrence crafts a darker, smoother movie than the first. Whereas Ross favoured use of kinetic shaky cam, Francis Lawrence utilises more fluid shots to create a sense of journey and the uphill battle to stay alive. The special effects employed in Catching Fire are marvellous in execution, especially the various obstacles that are thrown the way of Katniss. These include tidal waves, birds that mimic the screams of a loved one and some seriously vicious and brutal baboons. The score provided accentuates the struggles, pain and horror that befalls those competing. One flaw could be the length of the film as it does drag in places, but overall the running time is appropriate. What gives Catching Fire its thought-provoking edge is the cast of it. 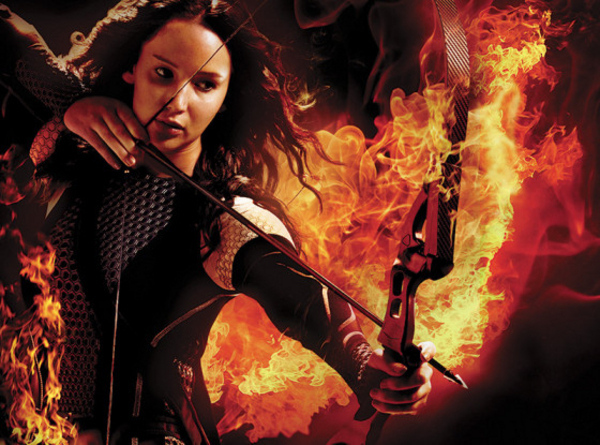 Jennifer Lawrence once again is phenomenal as the heroine Katniss Everdeen. Lawrence lets us glimpse the emotional scars she suffered that she hides behind her strong, armour like demeanor. As a result, Katniss emerges a multi-dimensional character, alternately strong and capable but also caring and vulnerable. It is Lawrence’s performance that gives the film its heart. Josh Hutcherson rises to the challenge by being given more to do as Peeta than in the last movie. Liam Hemsworth follows suit with a more expanded role. Woody Harrelson and Elizabeth Banks are both on fine form as the returning mentors to Katniss and Peeta. Newcomer Sam Claflin is charming as the capable contestant Finnick and Jena Malone is a stubborn, sullen but moving presence as Johanna. Donald Sutherland is gleefully nasty as the corrupt President Snow, while Philip Seymour Hoffman works well with his enigmatic role . The ever-reliable Jeffrey Wright provides the brains as the techno wizard and Amanda Plummer is delightfully kooky as his wife. Lenny Kravitz is touching as the sympathetic stylist to Katniss and Stanley Tucci is a hoot throughout. Combining thrilling action, interesting parallels with the subtext of media manipulation and well-drawn characters, Catching Fire proves itself as a successful sequel and great movie in its own right, spearheaded by the evocative and strong performance of Jennifer Lawrence.